Lechon is a hit at World Street Food Congress which opened Wednesday in Singapore, according to Dedet dela Fuente of Pepita's Kitchen. "Guess who has the longest line? Philippine LECHON is a HIT." The World Street Food Congress (WSFC) 2015, which is being held at the open field along Tan Quee Lan Street and runs until April 12, features a smorgasbord of world class street food displayed at 23 stalls from 12 cities from Bolivia, India, Germany, Vietnam, Philippines, Indonesia, Malaysia, Thailand and the host country, Singapore. Dela Fuente is representing the Philippines along with Claude Tayag of Bale Datung, which highlights the sisig, ABS-CBN News reports. Her popular truffle lechon was also served at a one-night-only charity dinner, also in Singapore, earlier this year. Also participating in the food event is American born Philippine heritage chef Paul Qui, winner of Top Chef Season 9 in the US. Likewise attending are food bloggers Anton Diaz of Awesome Planet and JJ Yulo as well as Mercato Central’s RJ Ledesma. In his Facebook page, the latter proudly said Singaporeans are also lining up for Qui's kinilaw and chicken inasal tacos from his East Side King food truck. Ledesma went on to announce that the event will be held in the Philippines next year. "We will be bringing the World Street Food Congress to the Philippines in 2016! 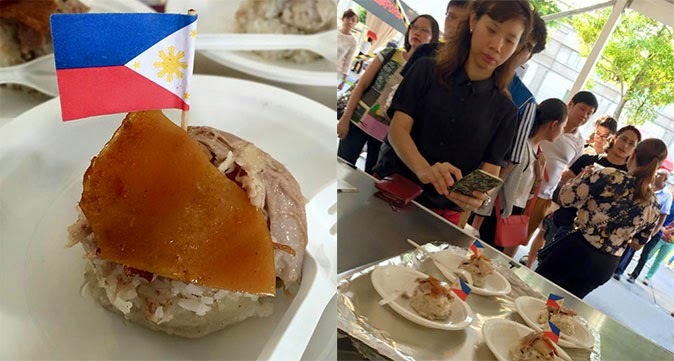 A perfect opportunity to introduce Pinoy street food to the world foodie community," he posted.